Ko Sai, as any Star Wars fan worth their salt will tell you, hailed from the planet Kamino and was the chief scientist behind the creation of the Grand Army of the Republic. It is also a small rocky island set in the Gulf of Thailand. I’m assuming that (unless he’s a closet sci-fi fan) Newcastle’s most prolific restaurateur Terry Laybourne had the latter in mind when he named this Asian street food joint. This is the final part of a trilogy on the dining options in the all-new Fenwick food hall, joining my previous reports on the excellent Fuego and slightly-less-impressive Saltwater Fish Company. How would this final incarnation manifest itself - Hans Solo or just Jar-Jar Binks? Regular readers already know of my passion for the flavours of southeast Asia. There is something profound, almost alchemical about what happens when ingredients such as chilli, galangal, fish sauce, holy basil and lime juice are brought together in correct proportion and proper preparation. Sadly this is not something that happens terribly often in Newcastle (the City has been crying out for a good Thai restaurant for years) but I’ve enjoyed the Asian cooking of talented chef Parichat Somsri-Kirby at one of Café 21’s supper club evenings, so it was with keen anticipation that we took our seats at her new noodle bar (a joint venture with her mentor Laybourne). 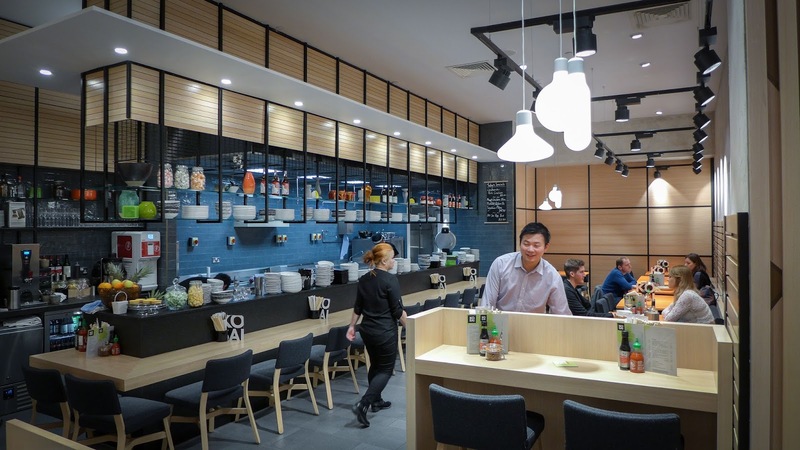 Like the rest of the food hall, it’s a light and modern space, with an open kitchen spanning its lightly-wooded length. The menu offers up a concise but varied selection of snacks and small plates at around £4-6, as well as salads alongside more substantial main dishes at the £9-11 mark. We decided to share a bunch of the former as well as a couple of the latter. I caught myself tutting audibly at the paltry house wine offering: only two each of red and white, and one rosé. The whites were a Chilean Sauvignon and a Pinot Grigio. Not just dull, but also not what I’d normally order for this kind of food. Where was the off-dry Riesling or Grüner Veltliner? I considered marching over to the wine shop, before consoling myself with a bottle of Wylam’s very good La Saisonnier beer, with its cooling lemon balm softness. Now we just needed some spice to match it. The first wave of dishes was as quick to find its way from the kitchen to our table as a tuk-tuk through the streets of Bangkok. 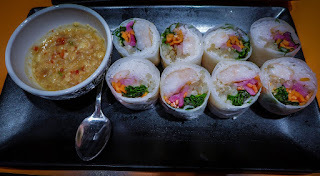 Summer rolls were blasts of vivid colour in which coriander, carrot and some sort of pickled brassica were packed into rice paper jackets alongside bouncy prawns and vermicelli noodles. The flavour was a little muted, but more than helped along by the fishy funk of the dipping sauce. 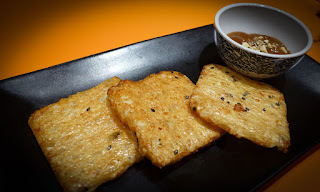 Another sauce, the peanut effort that came with sesame rice cakes, was a delicious umami-rich potion. A shame then that the rice cakes themselves, dull slabs of mouth-clagging dryness, were scarcely distinguishable from the shop-bought variety. Fish cakes were nicely burnished and contained plenty of salmon, but they had a slightly odd eggy texture. There was a lack of zing and thwack about them, as if the flavour dial had been turned down a notch or three. The accompanying cucumber relish did its best to redeem, but couldn’t quite make it. Much better was a steamed pork bun, starring deliciously rich meat and a bun that was just the right side of stodgy. 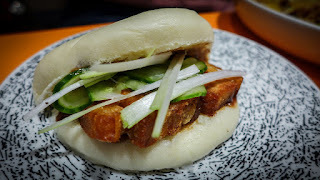 A more imaginative filling than sliced cucumber and scallions would have elevated this to the bao premier league. Definitely worth returning for. I had some quibbles and niggles about the mains. 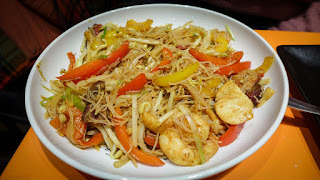 While Mrs Diner’s Singapore Vermicelli packed some lovingly-cooked prawns, scallops and pork, it was bulked out with a surfeit of (unadvertised) red and yellow peppers, and the spicing was quite two-dimensional. If you have a serious passion for peppers, this is the dish for you. Mrs Diner doesn’t. 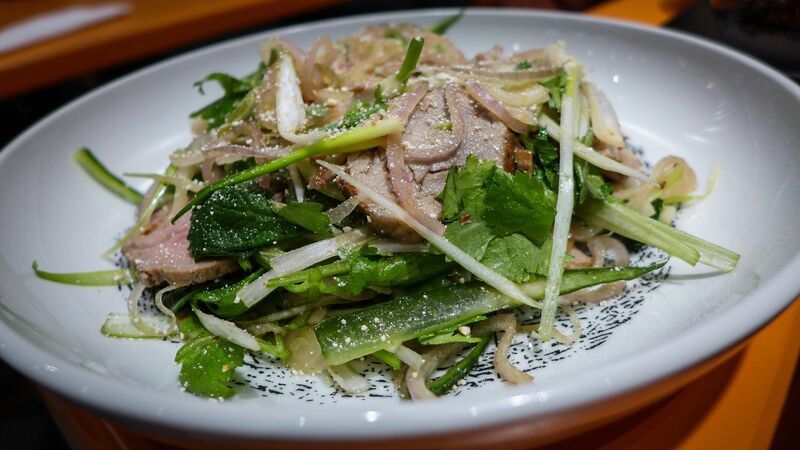 For me, there’s nothing quite like a good punchy and vibrant Thai salad. The pork one served here was actually quite like a good one – it certainly had spice, for it successfully set fire to my mouth, but the heat seemed to be coming from chilli flakes rather than fresh specimens, which made the punishment out of proportion to the flavour. The pork itself was nicely cooked but, coming from fat-free tenderloin, it lacked depth of flavour, especially as it was served quite cold. With my palate now ablaze, I was relieved to see on-trend soft-serve ice cream among the desserts. 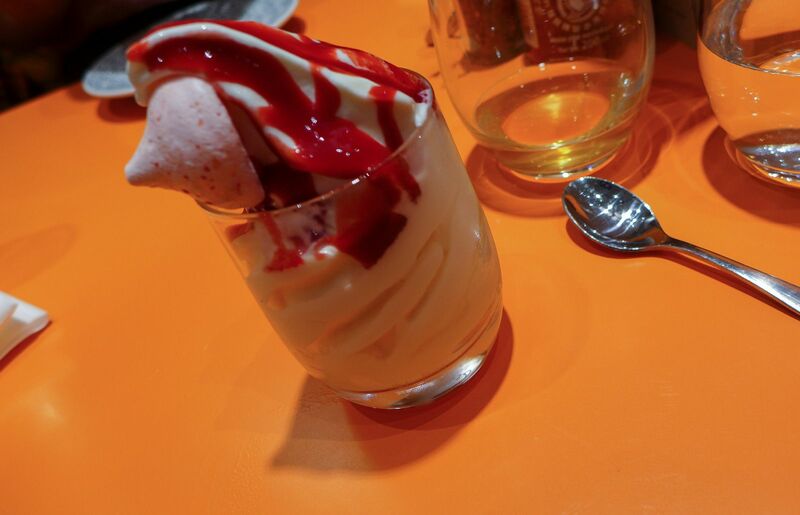 The yuzu variety I plumped for had that exotic fruit’s characteristic sharpness, in addition to being refreshingly cold. Mercifully so, for the sake of my tongue, which was still flaming from the salad. 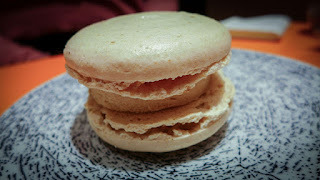 I could see Mrs Diner was enjoying my discomfort almost as much as she was loving her ice-cream macaroon. 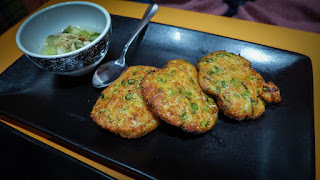 I don’t mean to whinge – next week sees the start of my annual awards season, so from now until the end of the year I’ll be offering restaurants nothing but praise – and in fact Ko Sai wasn’t at all bad, hence its three stars. It’s a very nice spot and the service, as always in a Terry Laybourne eatery, was first class. It just lacked some of those killer combinations of flavours I look for in an Asian restaurant. It’s still early days, and I’m willing to believe that either I caught her on a slightly off day, or that head chef Somsri-Kirby will get everything sorted before too long. Even based on this one visit, it’s a pretty impressive find in a department store and miles better than the conveyor belt sushi it replaced. All in all, Fenwick has really nailed it with these three new food offerings. Together, I reckon they almost make Christmas shopping fun. Almost. 1. The quality did not deserve it. 2. It was not advertised. 3. I'm was eating food in a shop not a fine dining establishment. that's why it closed down.